Even if you didn't back it up, you might still have a chance. Nannette Abia Rivera’s external hard drive stopped working, and she needs to recover files stored on it. When you store files on an external drive, it’s easy to forget my first rule of tech storage: Never have only one copy of anything. We tend to think of external drives—especially external hard drives—as a backup medium, so of course anything on the drive must be a backup. But if files exist only on that external drive, they are not backed up. And you need to make sure they get backed up to something other than that particular drive—whether it’s an internal drive, the cloud, NAS, or another external drive. Okay, the mistake has been made. Now let’s try to get those files back. When you try to use the drive, does it make noises you’ve never heard before—clicking, for instance, or grinding? If so, make no attempts to recover the files yourself. Send the drive to a data recovery service. Sorry, but I don’t recommend one data recovery service over another. I’ve never needed to use one (I back up), and there’s no practical way to test them fairly. But if the drive doesn’t make any new sounds, remove it from the computer and give it a good look. You’re about to take it apart. An external hard drive is really just an internal hard drive in a case, with a SATA/USB connector. Look for tiny screws on the case. If they aren’t there, use a small, flat-head screwdriver to pry the case open. Be careful not to damage the drive, but don’t sweat about the case. When you open the case, you might find that the internal drive has come loose from the SATA and/or power connection. If so, reconnect, plug the USB cable back into your PC, and try to access the drive again. If that doesn’t work, the problem could be in the case’s adapter. Remove the drive from the case, and use another SATA-USB adapter to connect the drive to the PC. I’ve seen them on sale for less than $10. 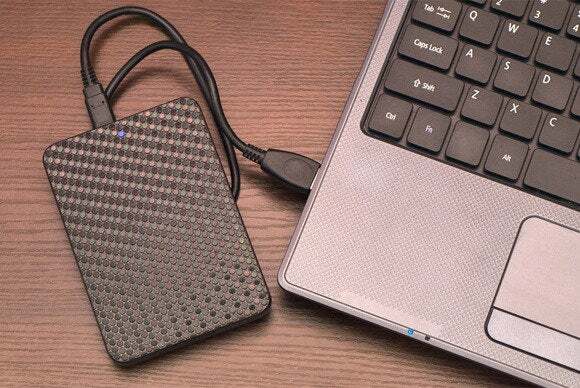 If you can access the drive’s contents, move your files to your internal drive, or to another external one. Better yet, copy the files to both so you have a backup. If you can access the drive, but there are no files on it, you can try file recovery software such as Recuva. Beyond that, we're back to using a data recovery service. They’re expensive, but that’s the price of not backing up.